First, let me be clear that I am not talking is not about free builders AND free hosting. When you are speaking of free website builders there are two types you will find. All free website builders, or at least the only ones that I would recommend using, come with a domain name, a solid hosting account (room for future growth) and offer great support, online video tutorials, and are extremely cost effective. There are many companies that are trying to cater to the Small Business crowd. All of them have their pros and cons and instead of listing them all out for each and letting you compare, I will just cut to the point and let you know that these 3 are the ones I would most recommend you use. A real hidden jem most dont know about, Voda Host uses a program called Blue Voda to build your website. You down load the Blue Voda application to your own PC and build the site (locally), drag and drop to build from scratch or modify one fo the templates with hundreds of images, logos, headers, backgrounds etc., then “One Click Publishing” simply uploads your files to your server. Normal hosting account, with FTP access, email, cpanel etc. You are limited to your design skill. There are templates you can start with, but no matter what, its a free website builder and your design is going to suffer. While using the Blue Voda website builder is really easy to do, there will be a learning small learning curve. Nothing as sever as learning a full application like Dreamweaver. If you know Microsoft word, you are going to be in great shape! You get more than just a “site builder.” SBI focuses more on the SEO (getting you found online) part of web design. Everything you do and build with SBI is steered by how it will effect your search engine rankings. Also, you don’t need to worry about looking for separate hosting, paying for a separate keyword research tool, handling site submissions, integrating auto-responders, etc., SBI is completely inclusive and helps you understand why your are doing what your are doing. The block-by-block builder is perfect for beginners or advanced users. SBI! includes domain name analysis, optimization, and registration. New Tools constantly added, so you are always up-to-date. Extensive training videos for every aspect of building your website. The design (Look and feel) is rather older looking. But this is only because they concentrate more on the optimization of the site for searches and page load times. Its kind of like using AOL. Its the best part of web design but you substitute the design and portability flexibility, for comfort of ease of use. Similar to the Blue Voda application, Webstarts is an online application that lets you drag and drop your text, images, media anything you need and place it wherever you want on the page. Can add forums, galleries, member only pages, shopping carts etc. No direct server access. Meaning you cannot edit the programing code of the site. If you choose to move, the site will not be transferable to another server. Free version: Not recommended. Limited size, functionality, no domain or email and ads. While this sounds great, you know there’s a catch. There always is. All the companies that fit into this category are looking to get you deeply embedded into their free system so they can simply Up-Sell you to alleviate some of the “Issues” you are going to experience. No FTP access for getting files off or on site. ADS!! Most Free website builders will put adds all over your site. Little to Nothing as far as web hosting space. Could Disappear Randomly Go out of business or stop offering it. No Support Stuck with figuring it out yourself. Still want to use a FREE Website builder ? There are reasons why you might want to use a free website builder. Well if you fall into these categories, and still would like to build a website using a Free website builder then here in my professional opinion, are the only Free website builders I would recommend. A relatively new comer to the Free online website builders, MoonFruit’s main difference is the flexibility in changing the site design. The layout of the site is controlled by a Page Master and it works similar to a master template in Powerpoint (changes appear throughout the site). 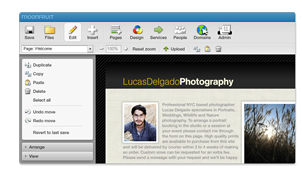 The site creation tool is called Sitemaker. It is completely flash-based so there is no custom html allowed, they get around this negative by offering various objects that can be used with your site such as a photo gallery, mp3 jukebox, and comment widgets. Every piece of your site design is made of drag and drop objects so you simply click on an object such as a text box and you’re able to move it around the page. The organization of the navigation menu and pages is handled very easily in the site as well. Hosting is free is you don’t mind the Google Adsense ads that show up around the site. If you want to have an ad-free site then you simply pay $4.50 a month for hosting. Similar to WebStarts above, MoonFruit is a little more limited. Not really a Website Builder, more of a template modifier, Yola has the lease of all the issues I mention above. However, it is a new company and I can’t speak for it longevity. Yola has an excellent reputation on the internet as a reliable and feature-packed web hosting and web building program. Reports from people who use it are that the features are outstanding, the customer support–even for free members–is responsive, and the staff is always willing to listen to suggestions for improving the service. The free account is just fine for many people, but even the cost of the pro account is more than reasonable. This service is worth checking out. I get a lot of emails about the following website builders and wanted to go ahead and mention then here so you don’t think I missed them, but really they are not any better the then Yola or Webs. Actually, they have even more limitations then Yola and Webs which is why I didn’t include them originally. But here they are. I like the ability it gives you for adding different types of content…but even as a professional web designer, I had a hard time getting the content on my page to show how I wanted it to appear. How bad is that. Granted, I didn’t spend a lot of time on the site, but these are supposed to be intuitive. Another negative is the templates. Not a very good selection. And hey, if you are going to use a Free Website builder, then I would think finding one that has at least a few decent templates would be a high criteria. While you come to expect pretty good stuff from Google, ( I definitely use A LOT of their products and services) this is not quite mature enough. It still to new and has some pretty blaring issues. First of which is the ability to display correctly in Firefox. With 25+% internet user using the Firefox browser…that is a pretty big goof on Googles part. Also, the template selection is VERY VERY limited. OK so you if you fit in the Free Website category then thats AWESOME for you. And I hope that you have chosen at the very least one of the top 2 recommended sites to do it. If you just saw this page and thought maybe this is something you want to take a little more seriously, then head over the next page where I will guide you through the ins-and-outs of a template website using one of the standard website builder tools available to you online.